Two-storey bach at Raumati Beach on an elevated site.. Restful getaway for a couple or a small family. 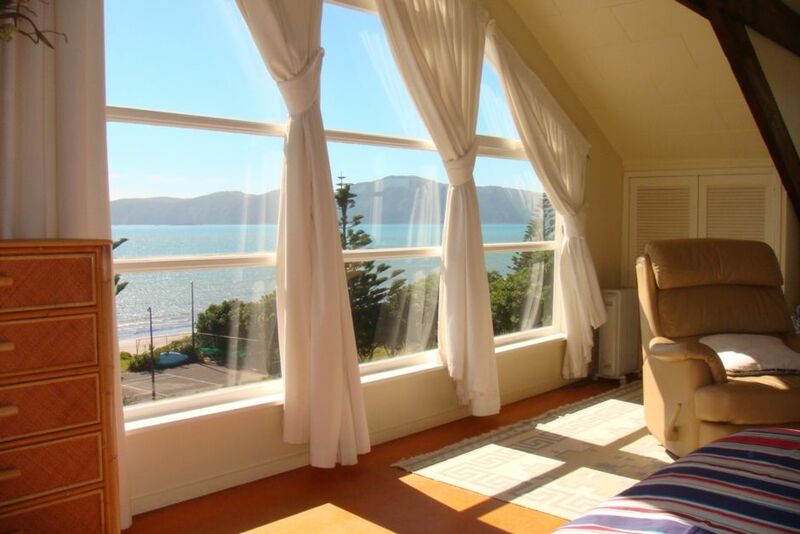 Restful, spacious bedroom/sitting area upstairs ( with Queen bed) with views of Kapiti and Mana Islands. Small bunkroom downstairs with 2 sets of comfortable bunk beds. The bathroom is downstairs and has a bath with shower overhead. Flat, grassy areas on all sides of the house. You can drive right to the front door for easy access. Rectangular trampoline with safety pads is very popular with children. The sunsets are spectacular as the sun sets on the horizon for most of the year. Since the destructive storm of July 2016 ( our steps were washed away) access to the beach is via the public access at the end of Arawa Sreet. Enjoy our seating area ( bench seat and small table and 2 chairs) at the end of our path near the beach. Facilities: Trampoline, 2 kayaks, barbecue, petanque, 2 bikes, boogie boards, board games, CDs, Freeview TV, DVD player, Unlimited Wi-Fi, Electric heaters, washing machine and dryer, clothes line, dishwasher. The bach is equidistant between Raumati Beach and Paraparaumu Beach shops and you can walk or cycle in either direction and be at cafes, shops, playgrounds, the skateboard park and the very popular Raumati water playground for young children. - 3 minute drive to Paraparaumu Beach Golf Club (links course). Nga Manu Nature Reserve, Southward Car Museum, Te Horo Lavender Farm, Gliding at Paraparumu Airport, QE 2 Park, art galleries all close by. - 45 minutes drive from Wellington. Ideal for school holidays and commuting in and out of Wellington. Parties are not permitted at the house - it is a quiet neighbourhood. Internal staircase stair treads are quite shallow and could be tricky for elderly people and young children. No smoking and definitely no pets. All your linen is included in the price. Great place to relax and wake up to an amazing view of the waves, Kapiti island and long stretch of sandy beach. Our kids loved the trampoline and we all enjoyed the proximity to the beach for an evening walk or boogie board before sunset. Thanks for your hospitality Frances. We would recommend a stay here. The Blue Triangle is a great little bach with amazing views of Kapiti Island. It had everything we needed (including a lovely deep bath tub!) and only a short walk to the shops. Frances was very friendly and helpful and provided us with plenty of information about our stay. We had a very cozy, relaxing few days. Great you enjoyed your time at the Bach. Many thanks for leaving everything so perfect and do come again one day. AMAZING -simply perfect location -views to die for -quiet and cosy with everything you could possibly want in a bach ,loved every minute of the relaxing vibe here. Fantastic location - 2 mins from Raumati beach shops and wonderful playground. Fantastic location - 2 mins from Raumati beach shops and wonderful playground. Gorgeous views of Kapiti Island from both levels of the house. The house was lovely - very well equipped with lots of board games, DVDs, books and magazines. Very cosy with heaters in each room. Would definitely stay again. Wonderful views of Kapiti island. Wonderful views of Kapiti island. Sunny and well kept place, with bikes etc. Enjoy the bike trails towards Paekakariki and Waikanae. Great walks up and down the beach or if you prefer there is a walkway ( for scooters, bikes etc) alongside the beach The Raumati splashpark is very popular with children.